Marine Emission Control System Market size will surpass USD 14 billion by 2024, as reported in the latest study by Global Market Insights, Inc.
Stringency in the government mandates pertaining maritime pollution coupled with rising environment & health concerns will drive the marine emission control system market growth. The IMO has launched a directive with an aim to reduce nitrogen oxide emissions by diesel engine vessels, built or installed on and after 1st January 2016. In addition, the IMO further declared global sulfur limit in 2016, reducing the sulfur content in fuel to 0.5%, that will go into effect from 1st January 2020. 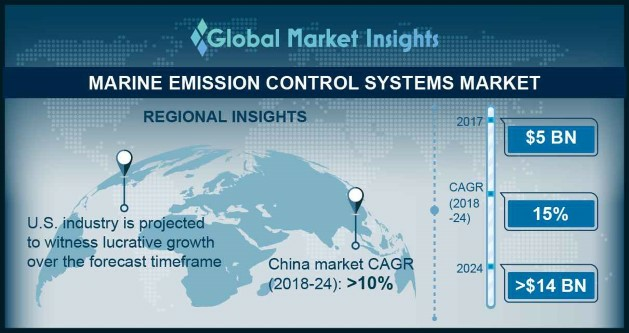 China marine emission control system market is set to grow on account of increasing FDI flow coupled with cross-border mergers, acquisitions and tax inversions. The Chinese Ministry of Transport, on 3rd July 2018, published requirements with an aim to limit NOx emissions. The norms are applicable on engines imported and converted for domestic trade on & after 1st September 2018. Installation of scrubber systems will witness an upsurge in demand owing to long term operational flexibility and less payback period. Hybrid scrubber system’ ability to treat high temperature and gas streams will positively impact the marine emission control system market share. In addition, increasing IMO directives to combat SOx emissions from marine industry along with R&D initiatives toward green shipping will complement the business outlook. Recreational applications are anticipated to grow on account of rising disposable income and improvement in living standards. Ongoing investments in the development of tourism sector along with increasing demand for comfort and luxury will positively impact the marine emission control system market size. Commercial applications will witness growth owing to stringent government mandates coupled with rising cross-border trade and long international voyage. Ongoing replacement and upgradation of old vessels with an aim to adopt sustainable systems is further projected to drive the marine emission control system market growth. Some of the major marine emission control system market participants include Wärtsilä, Yara, Alfa Laval, DEC Maritime, Clean Marine, DuPont, Shanghai Bluesoul, Niigata Power System, Mitsubishi, Fuji Electric, Johnson Matthey, Kwangsung, Tenneco, Damen Shipyards, Ecospray Technologies and H+H Engineering.